Delhi's chief minister has shut all schools in the Indian capital for three days as its citizens struggle with choking smog. All construction and demolition work has been banned for five days in the city. Water will also be sprinkled on main roads to help suppress dust. Mr Kejriwal advised Delhi-ites to stay indoors as much as possible and work from home if they can. Other measures announced by the government include fighting fires at landfill sites, and shutting down the coal-based Badarpur power plant. 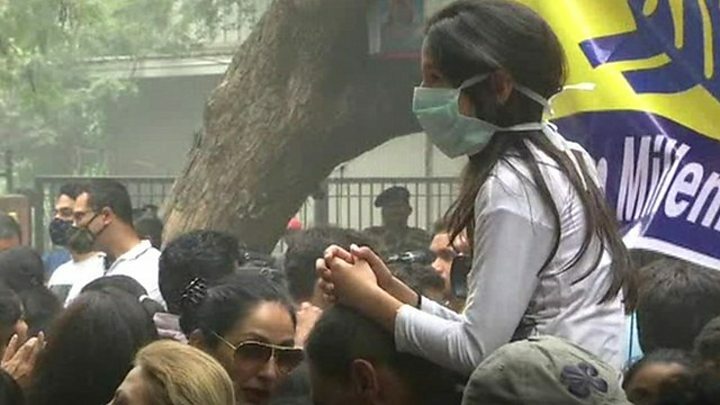 About 1,800 municipal schools had already been shut in the capital on Saturday because of pollution. The move came after levels of PM2.5 - tiny particles that can clog people's lungs - soared to over 90 times the level considered safe by the World Health Organization (WHO) and 15 times the Indian government's norms. India's NDTV quoted an official of the India Meteorological Department, who said visibility in Delhi was just 200m (656ft) at 8.30am local time, "caused by the heavy fog and smoke". Mr Kejriwal called on India's national government to help control the smog which has enveloped the city since Diwali. The Hindu Festival of Lights is widely celebrated with fireworks, which release soot and dust into the air. During the winter months, Delhi's pollution is aggravated by many of the city's poor burning rubbish at night to stay warm. Delhi's air pollution levels have been a concern for some time, and the Indian capital has vied with Beijing for the unwanted title of "world's most polluted city". The Delhi government has tried various schemes to contain the problem, including a crackdown on diesel vehicles, and a car rationing scheme where those with odd and even registration numbers were banned from the roads on alternate days. Air pollution is a leading cause of premature death in India. WHO figures show that about 620,000 people perish every year from pollution-related diseases.